MARCUS MYERS started out playing and singing in Punk, Indie bands in Brighton, notably “Midnight and the Lemonboys”, touring and supporting U2 on their first tours of the UK, aged 17. Nick Sayer (lead guitar) went on to form Transvision Vamp with great success. Chris Anderson (Bass), Mark Storr Hoggins (Drums). For more information and songs check out the website “Punk Brighton”. At some point they used the name, “Jewels Shine Darkly”…..Marcus also filled in for his band mate Del Greening in “Peter and the Test Tube Babies” and “Flesh for Lulu” when needed (broken arm!). Marcus moved to London and auditioned for Killing Joke when Jazz went to Iceland, but ended up forming a new band with Martin Glover (Youth) called “Brilliant”, there were various members, too many to mention but include Stephan Holbeck (bass), Andy Anderson(drums) releasing three singles, along with a song on the “Bat Cave” album and one on “The whip”, compilation album. They toured throughout the Uk, headlining and supporting “Bauhaus”, “New Order” and “The Belle Stars” amongst others. They played a couple of gigs in Barcelona in 1983. Marcus left just as they signed to Food records. Jimmy Cauty took over guitar before going on to form KLF, with great success. June Montana took over lead vocals from backing vocals. Although “Brilliant” had in the region of 32 members at various times, they only had the two vocalists. He then joined “Hard Rain”, signed to London Records, released two EP´s, made a movie (starring in and doing all the incidental music, which they never got paid for) called “Forbidden Sun” in the USA, the “Bulldance” in the UK. Starring, Lauren Hutton, Cliff de Young and Robert Beltran (Chakotay in Star Trek!) It was filmed in the former Yugoslavia.The band consisted of Marcus (rhythm guitar, Vocals) Bruce Maxwell-Smith(lead guitar), Simon Laffey (Bass Guitar), Steve Phypers (Drums). They had a very successful Thursday night residency at the Marquee on Wardour St, London, supported Then Jericho, The Alarm, the Boomtown Rats amongst others. Then they split up. He then joined “Then Jerico” (London Records), when the original singer left. Marcus (vocals and acoustic guitar), Scott Taylor (guitar), Rob Downes (lead guitar), Jasper Stainthorpe (bass), Steve Wren (drums). They wrote and recorded some great songs, but were left to languish by the record company before finally splitting up. Release those songs Scott Taylor!!! Luckily “Commanche Park” needed a guitarist and songwriter. Kathleen Pearson(vocals), Desmond Brown(Vocals), Marcus(Guitar, Vocals), Jamie Petrie(Vocals, Keyboard). They released two singles and two videos with Sony. The band were dropped by the record company after recording a great album in Richard Bransons Manor studio, never to be released. Marcus then spent a couple of years as a motorcycle courier in Central London……. 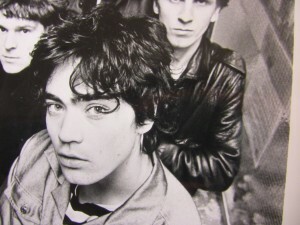 Eventually he joined “Alisha’s Attic” as a guitarist, they had numerous hits, toured the world and appeared on many TV shows including “Top of the Pops”, “Live and Kicking”, ” TGI Friday”, “MTV”, “Richard and Judy”, “The Word”, “The White Room” etc…. etc… Eventually the sisters decided to go their separate ways. Karen Poole is now a very successful songwriter and Shelley has a country band formed with her husband Ali McErlaine (Texas) ” Red Sky July”. Marcus went on to do session guitar work on various tours, notably Belinda Carlisle, Maria Nayler and Plavka. Playing in Japan, Ireland,Turkey, New York as well as the UK. He then moved to Spain to enjoy singing, performing, entertaining and living the life! Somewhat disapointed with the London music scene……..